Writing slopes allow you to position paperwork at a height, angle and position on your desk to ensure good posture when writing. 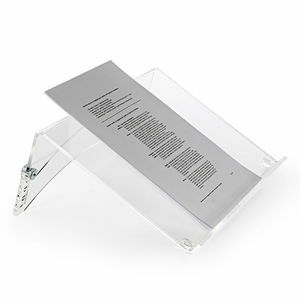 When writing, the majority of us place paperwork flat on the desk which requires a downward viewing angle. This causes discomfort and runs the chances of injury because the neck muscles are twisting and having to strain to write. Writing in this way also forces a hunched posture which places a strain on the back, shoulders and surrounding muscles. 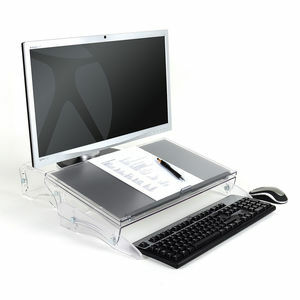 Writing slopes help reduce strain by raising paperwork off the desk to a more ergonomic height and angle. 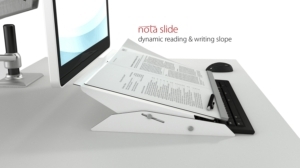 There is a selection of 2-in-1 writing slopes and document holders available such as the U Slope Pro which ensure ergonomic positioning for both reading and writing. 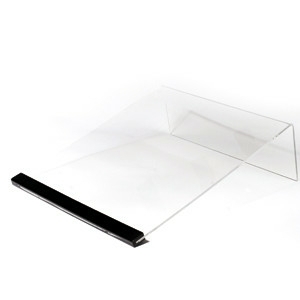 Why Should I Use A Writing Slope? Writing slopes help to avoid working in a hunched position and encourage sitting with an upright posture. This reduces pressure on the neck, back and shoulders and disk compression is minimised. As writing slopes bring paperwork closer there is less eye strain and the chances of getting headaches from strain are eliminated.